“… I have often heard people saying that older women should avoid wearing ‘beige’ as it is an ‘old lady’ colour, too safe and boring and also very draining on the complexion. What I noticed in a recent catalogue is a lot of ‘beige’ but hiding behind words such as: Toffee, Vanilla Pink, Toast, Iced Mocha, Putty, Toasted Almond, Pale Oyster, Almond Cream, Desert Sand, Heather Silver Sand, Heather Stone, Pale Oyster. What do you think about beige as a suitable colour for older women?”. According to wiki beige is a very pale brown color, variously described as a pale sandy fawn color, a grayish tan, a light-grayish yellowish brown, or a pale to grayish yellow. It can indeed be a tough color to wear depending on your specific skin color, but it can also look very chic, provided it is worn in the right way. One of the easiest ways to wear beige is as a bottom as you can see from the images below. That is also how I wore my beige / camel trousers and jacket a while ago with a cream top. I would probably add more color when I wear this again. Beige is also easier to wear when it has a bit of shimmer. My golden top for example falls in the beige color range, but it’s shimmery and more golden which brightens up the complexion and is therefore easier to wear. It also helps to wear it with a vibrant color and red lipstick. Beige is a really good neutral to combine with color. Wear it with a colorful jacket, cardigan, top or use accessories like scarves, necklaces and bags. This is how I wore my beige pants a while ago with red and here is a beige skirt worn with orange. In general, I would say to stay away from an all-beige outfit as shown by the models at the top. The color does tend to wash out many women (over 40) including me. If you like the look and feel of wearing a neutral all over, then cream or white may be a better option. They are brighter colors and don’t have that ‘drab’ feel about them. I actually really love an all-cream or all-white outfit. That said, beige can be a great base for adding colors. Choose colors that suit your complexion well or that make you happy. Play with various colors and young & hip accessories like contemporary jewelry or a funky bag and use beige as your canvas. 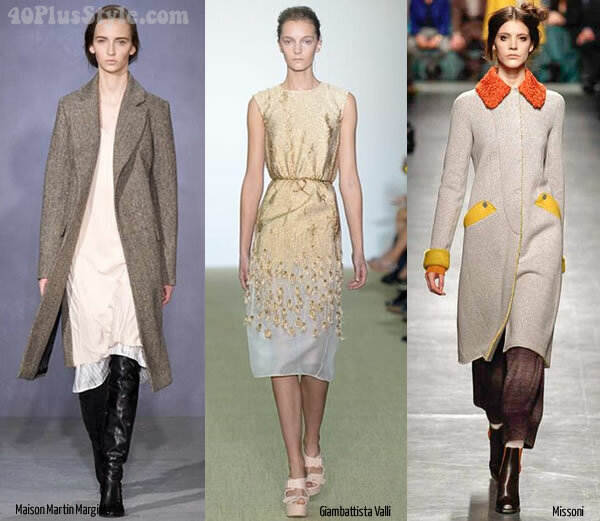 Below are just a few examples of how you can look stunning and chic with beige. What do you think about beige? Will you wear beige this season? Thanks very much for featuring my question Sylvia. Great article and it’s given me lots of answers and ideas. Great. Happy I could help! And frankly it’s not doing much for the under-40 (and probably under-20) runway models on top either! It would have helped if the models weren’t made up to look as UGLY as possible! A big reason I no longer read most fashion mags (like Vogue). As a magazine, InStyle has, so far, done a good job of ‘keeping it real”, in some instances, picturing JUST THE CLOTHES! IMHO there is nothing as classic, and timeless as a crisp white shirt. To make up for the lack of color, I make sure to add a bump more color to my make up. Sylvia, this is a wonderful site! I’m going to forward to a friend of mine who I know will love it too. Thanks for the feedback Melanie and welcome to 40PlusStyle! Great post, Sylvia. Beige looks ghastly right next to my face (I do like ivory, though), but I love it for skirts and trousers. Your array of colors shows it all. Most people can wear blue. But not everyone can wear the same hue of blue. The same is true for beige. Some beiges will look good on you, some will look good on me. And since there’s no line of demarcation where cream or tan ends and beige begins I say try it on and see what it does with your complexion. Yes very true. Changes of color can be very subtle and make a huge difference on how it looks on you. I see these light tones as a neutral that is good for mixing. Sadly all white is a color that I just can’t wear. If the lights have some color mixed in, for me it’s better. I do think women with darker skin colors than like look great in beige. Yes, that is true. I love how it looks on a darker skin. As for white, that is a tough one also. I love wearing white and use it as a base for jewelry but a warmer hue like cream is better for me too. I love a bit of beige, but think it looks a lot better on a darker complexion. Being very fair I’d only have it near my face on summer spray tan days. I think this is a great article though and like how you’ve styled your sets. Thanks Suzanne. Yes having a darker or tanned skin certainly helps with this color. Beige is one of my go-to wardrobe colors, similar to black. Feel free to share some examples either in the style forum or on my facebook page Antoinette. Would love to see your outfits. Please let me know what you think of this, I work for the (Ann Taylor) Loft and this season we are showing a lot of pale colors including beige and cream colors. I am seeing that beige can also be worn sucessfully if there is texture to the garment…we don’t have anything that sparkles this season but more lace and in diamond, french dotted and woven patterned weaves. I still recommend a detailed colored necklace, not chunky and heavy though because the garment can run delicate. Just wanted your thoughts so I can better direct my clients in this trend as our demographic is the 40-65 year young woman. Totally agree with every word Suzanne just said. Hi Marnell. I think that Suzanne has given some excellent advice here already. Textured beige can look a bit old so I think it’s important to add things that are a bit young & hip like good shoes or a modern (colored) jacket or jeans. It also depends on the kind of texture. I love the look of a chunky knit sweater coupled with a modern skirt for example. Thank you everyone! I will keep this in mind! Oh you lovely women… such good answers!! I like the idea of beige – I think it looks classy and expensive – but it might be too close to my hair/face colour. But as Lisa so rightly says, you need to find the right shade. Yes, you need the right color but also the right styling. Beige and I do not get along. At all. In fact white and beige are the two colours or rather non-colours I really don’t buy much of at all. They look awful next to my face. I do own one pair of khaki jeans that have yet to be worn. I think I must have been having a brain freeze when I bought them as I’d just gotten rid of some a few years back due to non use. I do own one beige pencil skirt that is okay. I agree…keeping it on the lower half is the way to go. I can imagine Suzanne. You just stick to all your wonderful colors! Suzanne, you can wear the khaki trousers with red, green, blue tops, surely? Sylvia, I love the look of beige on women (of any age), although it’s nost the best color on me. I try to gravitate with a beige that has a bit of pink tones in it. I would love to find a beautiful light beige blouse for the season to pair with white skinnies and give it a try. I would look forward to seeing it Trina! Beige/taupe/sand is my “black”. In the colder months (which seems like are going on foreve this year), I’ll add to that darker browns. I usually wear beige as trousers, jeans, skirts and shorts with something more colorful on top. Sometimes I’ll wear a colorful tee/blouse, and a cream sweater/cardigan (or cream top and colorful sweater). The examples in the last graphic could definitely be part of my wardrobe (though not usually as dressy). I agree about white and cream looking brighter…I can easily wear those near my face…but oatmeal or sandy colors are a little harder, so I stick with those on the bottom. I used to wear so many of those neutrals you describe too. I have changed to more color now, but still like beige garments as a base. You keep rocking those neutrals Rita! I don’t own much in beige color as most have said – it’s a color that washes out on a lot of skin tones. I am learning that if you pair with a bright/contrasting color or a statement necklace that it works. Great sets that you’ve created. You know that I love neutrals, but I’ve stopped wearing beige tops, they really don’t do anything for my complexion. I’ll still wear beige pants and shoes, and my trenchcoat is a light, cool, beige, but that’s about it. I totally agree though that it’s great with brighter colors! Beige next to my face – as many of you have already said about yourselves – isn’t my most flattering look. I do have beige linen trousers, a skirt and a beige tote that I love for the summer months, but I wear them with brighter colours to lift them. 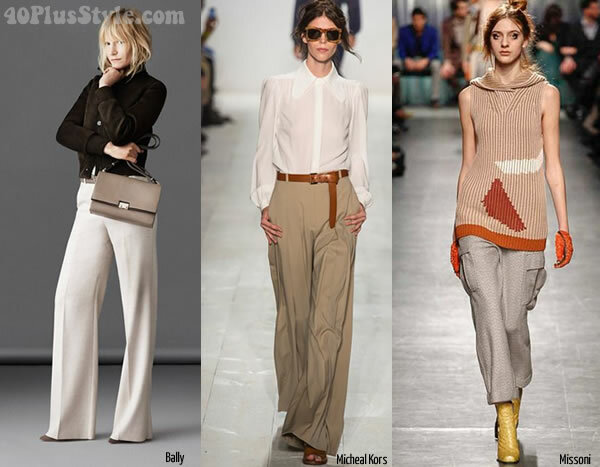 Beige on the lower half looks best in flowing fabrics for both trousers and skirts. I do think beige needs movement to be interesting, as in the fabulous flowing Michael Kors trousers in the second photo set above. This example is at the darker end of the beige spectrum, and more of a taupe — a colour that’s surprisingly hard to find. No khaki, sand, camel or beige near my face. Not without adding a bright colour like neon yellow, red, purple or orange to brighten up my complexion. Shiny beige tops, as you said, are better, but still need colour. If I look at your board I see that the beige dress on the right is very nice with the red jacket. Probably better than a white dress. I think that beige can be worn all over if you are beyond 40 depending on your skin tone. If your skin tone is beige than you are going to looked washed out if you wear it all over, but someone who has an olive, medium, or dark complexion may be able to get away with it. Of course there are different colors of beige and I think that if you go monochromatic with the right shades and accent pieces with pops of color than you can get away with it. 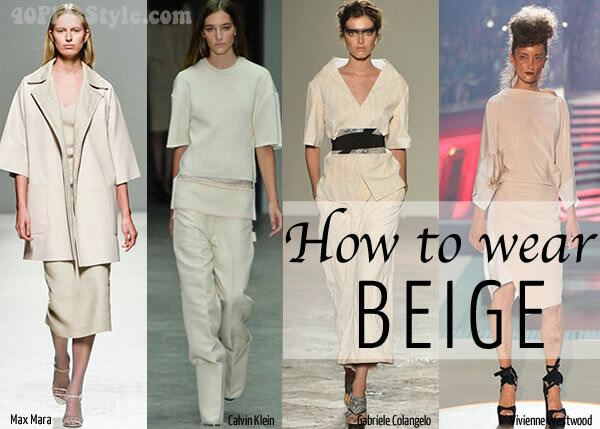 Very helpful tips on wearing beige. I was wondering how to find out the brands for the outfits you posted at the bottom. 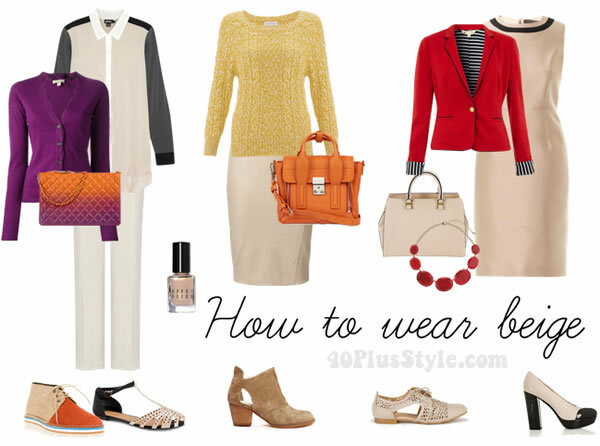 Specifically, I am interested in the beige skirt pictured with the orange bag in the middle set of pictures. Thanks! BEIGE MAKES OLDER WOMEN INVISIBLE!!! Don’t wear it – it suits no one! Great to read this article helped you Sabina! Difficult for me to say Madi and I don’t give individual advice. Perhaps you can wear it with a beige look and make it monochromatic. The scarf will add texture. Then you could acceesorize further with colorful bangles or bottoms. Sometimes, when an item just does not work, it is better to let it go…. Next post: Having twice the fun at New York Fashion Week – which outfit is your favorite?